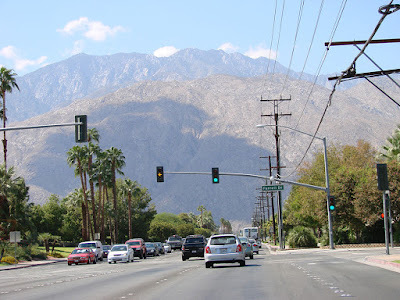 The mountains above Palm Springs are oh so thirsty. 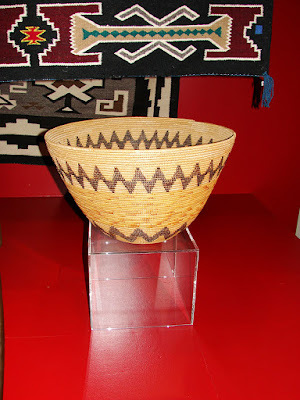 The Cahuilla were talented basket makers. This basket is made from palm fibers. 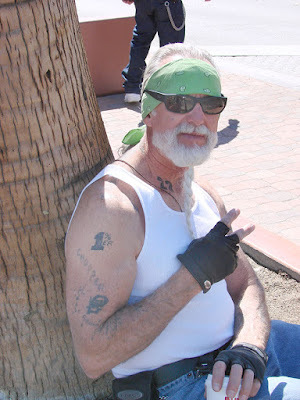 For more about the Cahuilla tribe go here. The Bank of America Building. Las Casuelas Terraza is in this building that was originally built in the 20s. There's some great Mexican food here and the atmosphere is a lot of fun. 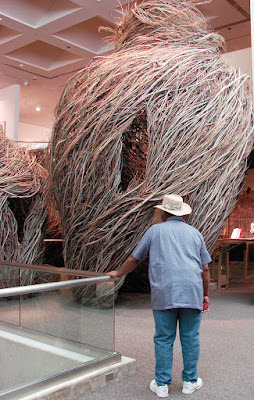 Patrick Dougherty constructed this, an art installation, one of three giant pieces, inspired by the shapes of Apache and Cahuilla baskets in the Palm Springs Art Museum’s collection. 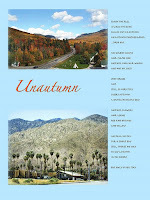 The Cahuilla tribe runs the Spa Casino and they have a fantastic Web site. 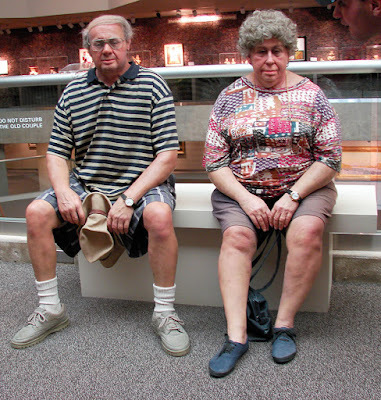 They'll be opening a huge museum (100,000 sq. ft.) here sometime in 2010. I wrote an article about it. 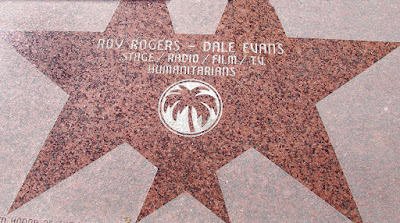 Roy Rogers and Dale Evans in two attached stars on the Palm Springs Walk of Stars. Just who were these two stars? 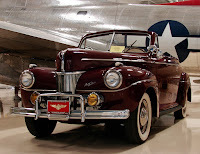 They were stars of the Roy Rogers Show. It's amazing that you can watch an episode of that show right here on my blog (see Roy Rogers link above). 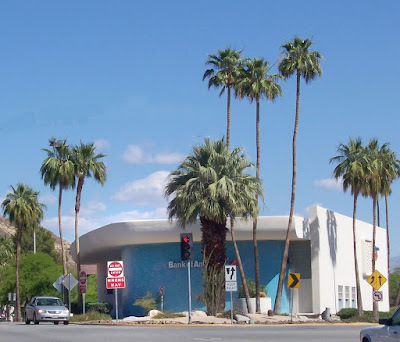 At any rate, here in Palm Springs we love Roy Rogers. There's a Roy Rogers and Dale Evans suite at the Coral Sands Inn. 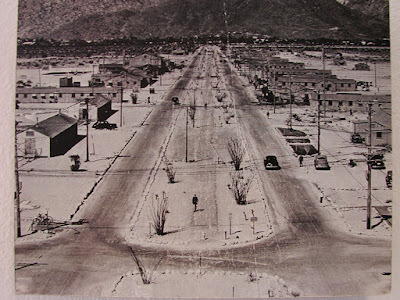 Rogers helped build Pioneertown, a place just north of Palm Springs where they filmed all those great B-westerns. 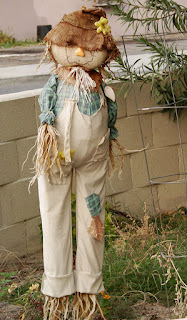 Moviemakiers still use the town to make movies and anyone can visit there, provided you have a liken for Western folk. 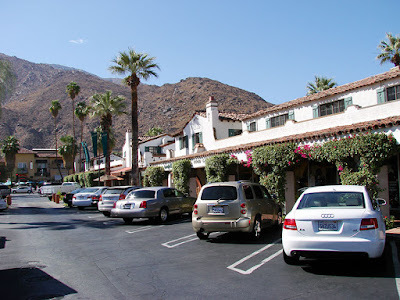 With red tile roofs, beige stucco and welcoming arches, Palm Springs' Spanish architecture, to some, breathes life into an otherwise mundane, minimalist modern. 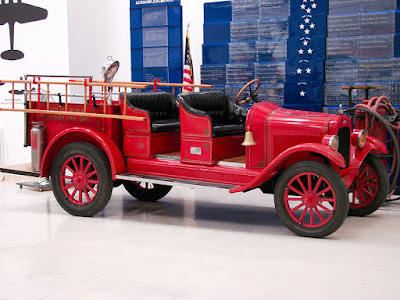 To be sure, I love modern, but, I'm growing fonder of the old Spanish style that was popular in the 20s and 30s. 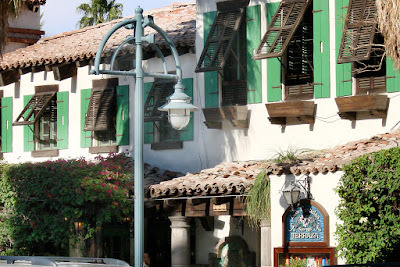 Many new buildings use a faux Spanish, which contains many more sharp edges at corners and higher roofs, not to mention a freshness that almost seems artificial. This week I'll be highlighting some more Spanish architecture. 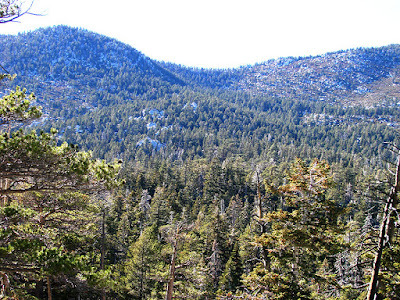 Hiking above Palm Springs on the Skyline trail (trail at Desert Museum) offers gorgeous views. 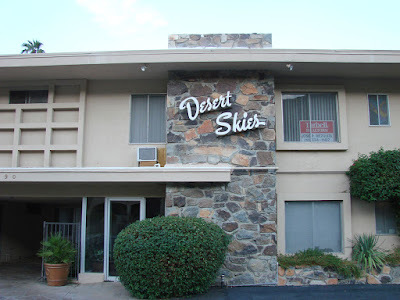 Love those 60s retro apartment building sign. I did it again. 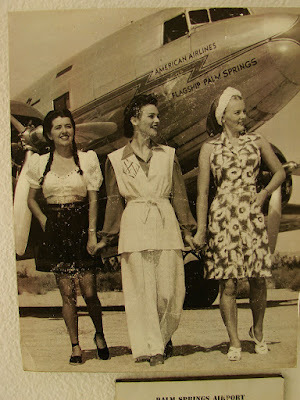 Who are these women in this photo taken at Palm Springs Airport in the 1940s? 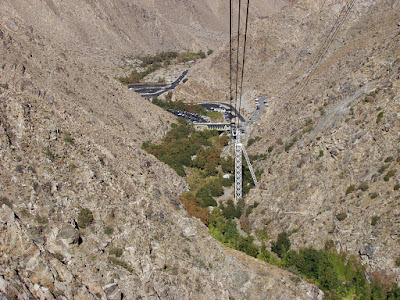 The green between the mountains just above the Palm Springs Tramway Valley Station. 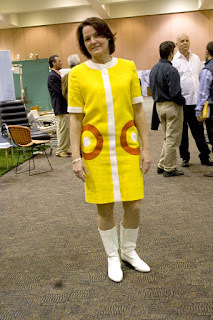 These people are a couple who, in a way, live in Palm Springs. Are they real or art? The bikers have come and gone. American Heat seemed to be a disappointment this year. 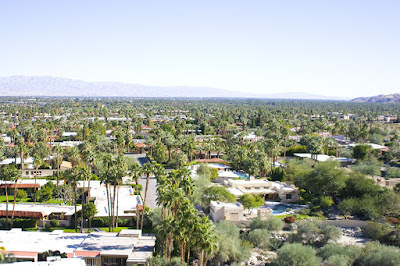 The event was not on Palm Canyon as it had been in years past. I looked for it on both Saturday and Sunday. There were streams of bikers everywhere, but not one booth nor vendor. 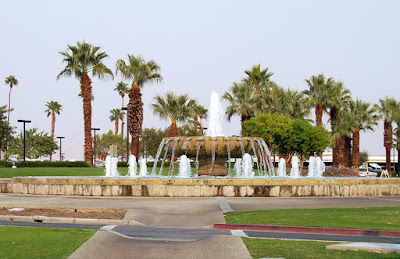 They were all in the parking lot of the Spa Casino, nearly three blocks from Palm Canyon. Too bad I found out after the fact on the news on KSEQ. Well, what do you think you'd find after my post of a World War II battle map? 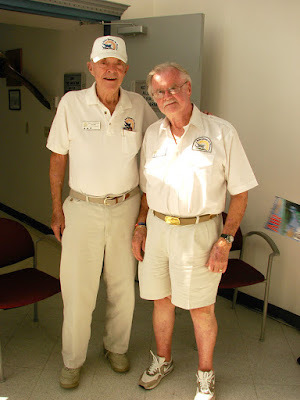 If you guessed a pair of World War II vets, you're right. 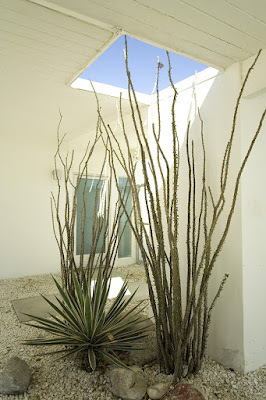 Patios in the desert often look like this. 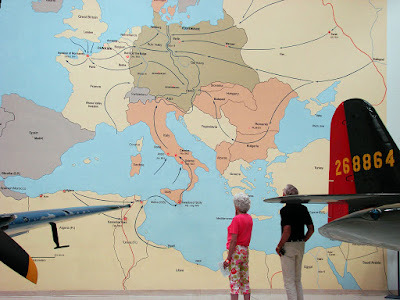 One more shot of the Air Museum, a map of World War II battles. 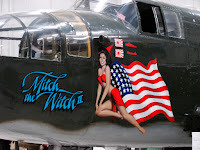 There's more than just airplanes at the Palm Springs Air Museum. Plane inside the Palm Springs Air Museum. 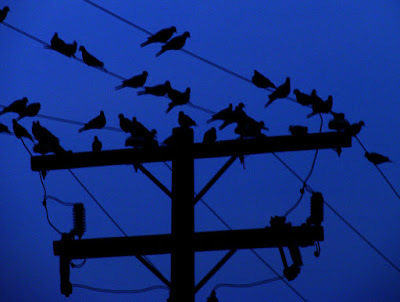 Guess what year this shot was taken. Yes, It's Palm Springs looking west toward Mt. San Jacinto. The shadow of a cloud as it appeared on a mountain today. To watch it change shape every second was especially fascinating.